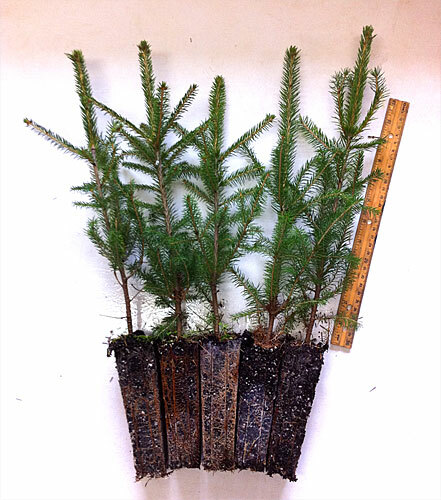 Norway Spruce plug transplants are a fast growing, dark-green spruce with short needles. It’s pleasant appearance makes it ideal as an ornamental, and the growth rate of Norway Spruce plug transplants is well-suited to applications such as windbreaks and privacy screens. However, its foliage is not as dense as some other species, and so planting two rows of this species will provide better protection. Norway Spruce are the dominant evergreen in Europe, and although they are not native to the US, they are commonly planted throughout the Northeast and as far south as Tennessee. They can survive even farther south if planted at higher elevation. However, Norway Spruce plug transplants are best suited to temperate climates, need full sun, and prefer richer soils. They can reach a jaw-dropping height of 200 feet, but most max out at a “merely impressive” 80 feet.